For those messed up with boisterous city life and less tended to tackle the rigours of arduous trekking in the Indian Himalayan region, the trek to the meadows of Dzongri that passes through the moss - laden wood of oak, chestnut, maple, pine, rhododendron and wide range of Himalayan trees will allow you to discover a truly spectacular eco-friendly ambiance in a span of one week (or maybe even less). Culminating in the meadows with unparallel mountain views at the horizon, the natural bed that is dotted with varied species of flowering and medicinal plants is also an abode of several endangered animals and avi fauna and insects at different altitude. It is an absolute naturalist's paradise. The journey further occupies you with the ethnicity of the local culture making the Dzongri Trek, which is one of the easy to moderate treks in the Sikkim Himalayan region, a frame of scenic beauty, wilderness and culture. The major attraction on this Himalayan trek in Sikkim is the majestic sight of the Kanchenjunga peak and further the sunrise from behind the snow clad range that turns the horizon opulent in gold enriches the journey. The Sikkim Dzongri Trek commences from Yuksom, which is the erstwhile capital of Sikkim and is located at a height of 1,780 meters. 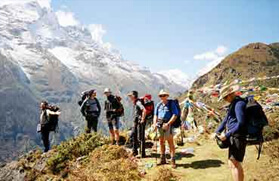 The trail thereafter ascends to Tsokha en route Bakhim, which is perched at an elevation of 2,700 meters. The entire trail to Tsokha cuts through tropical forests, splashing water bodies and fascinating rhododendron forests. From Tsokha the trek leads off to Dzongri via Phedang passing through the mystic, wild and colourful valley and lively gorges. The journey divulges the entire stretch of the Sikkim Himalayan region and once can spot the peaks like Mt Pandim, Mt Thenchinkhang and Mt Jhopuno at a binocular distant. From Dzongri one can even capture the majestic Himalayan range and be embraced with appealing views of Mt Khanchendzonga, Mt Kabru, Mt Koktan, Mt Jhoponu, Mt Thenchinkhang and Mt Narsing peaks. 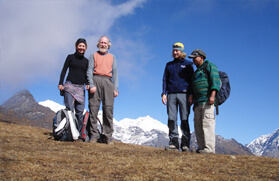 The downhill trek follows the same route via Tsokha to Yuksom and winds up at Gangtok. In the morning our representative will receive you from the Bagdogra airport/NJP Train Station then via road you will be driven to Yuksom. On the way to Meli get the Inner Line Permit (ILP) if someone does not have it. In the entire trek, this place is the major campsite. After you reach Yuksom dinner and overnight stay is arranged in the guesthouse. Today we will be starting our trekking from the local market in Yuksam and then following main road move in the North direction. Gradually after trekking for some time the trek comes out of the dale and reaches near to the right bank of the River Ratong Chu. Afterward, the troop will be crossing over 4 overpasses to ascend steeply in the North-West direction to reach Bakkhim, a small settlement. The trek will continue to move ahead for another three KM and pass through the dense forest of rhododendron and magnolia to reach Tsokha. After reaching Tshoka, we will have some rest and dinner at the campsite. We will also be staying here for the night. On this day, the trek moves ahead and passes from the village of Tsokha, and then the trek further continues to mount in the north, passing through a verdant rhododendron forest, and soon reach to Phedang (3650 meters) it will take about 3 hours to complete the precipitous incline. After that, we will continue the trek and head in the direction of Dzongri. After reaching Dzongri, we will have dinner and stay overnight at the campsite. This entire day is all meant for having some rest and acclimatization. You can spend the whole day exploring and enjoying the fabulous views of the soaring mountain summits by climbing upwards towards the Dzongri Top. 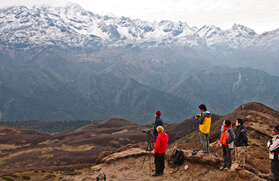 From this very spot you can get the magnificent panoramic view of various towering peaks like, Kabru (7353 meters), Pandim (6691 meters),Kanchenjunga (8534 meters), Koktang (6147 meters), Narsingh (5825 meters), and Ratong (6678 meters), and towards the western side you can see the wonderful Singalila Ridge. 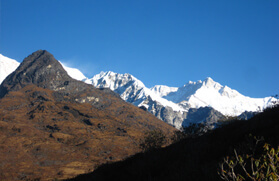 The Singalila Ridge separates Sikkim from Nepal. We will have dinner and stay overnight in the tents at the campsite. On this day of our trek, we will move forward to reach our next destination Tshoka. We will have dinner at the campsite and stay overnight in the tents. On this last day of the trek, we will move back over steps and head towards Yuksam. Today the trek will be an easy one as the trail is mostly downwards. We will be staying here for overnight at a guest house. After having wholesome breakfast we will drive forward in the direction of Bagdogra/NJP.